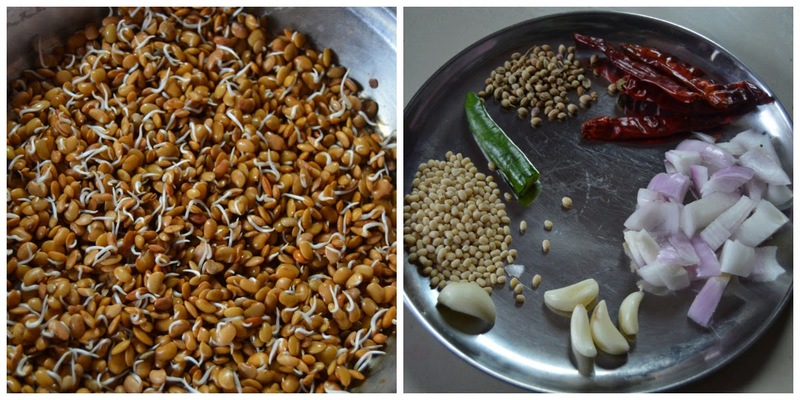 Pavi's Platter: Kollu Thuvaiyal / Horse gram Chutney! Horsegram / Kollu chutney is a very good choice when you look for ideas in adding horsegram to your everyday diet. Horsegram had lot of health benefits and it is very good for weight loss too. It is even suitable for diabetic patients. It can be served with rice or even idlis and dosas and a very good alternative to coconut chutney. Wash horsegram and soak it overnight. Next day drain the water and spread it on a plate and close and keep for 2 days and you will find it nicely sprouted. Alternately you can also drain it and tie in a wet cotton cloth and hang it in a warm place. In a kadai heat oil and once hot add the urad dal and fry till golden brown. Then add the chillis and garlic and fry them too. Then add the onion and saute everything together till the onion turns translucent. Meanwhile in the same kadai add litle more oil and fry the sporouted horsegram in a medium flame. Keep sauting it well for a good 7 - 10 minutes until the raw smell goes and they are almost cooked as shown in picture. Cool it and grind in a mixie along with salt and tamarind. Add little water while grinding. Then for the tempering add oil in a kadai, once hot add mustard seeds, followed by jeera , hing , curry leaves and dry red chillis. Turn off stove and pour this tadka on the ground chutney. Horsegram doesnt taste great, so you have to add more chillis and tamarind to bring some tangy and spicy taste in the chutney. Serve with hot steamed rice, or even idlis and dosas.